A good command of a country’s language and culture is essential if you want to do successful business abroad. You probably have to communicate with German business partners more formally than with those in the Netherlands, which is handy to know! Your British business partners, on the other hand, are very punctual, and they expect you to be so too! We often lack the finesses and nuances of another language and culture, while these are so very important when doing international business. Flow Languages introduces: the Go Flow Masterclass and Go Flow Workshop. During the 3-hour Masterclass, you will be given specific instructions with tips, suggestions for improvement, and insights into how you can improve your Business English or Business German. 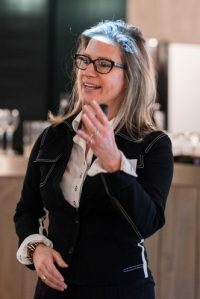 In the Go Flow Workshop, you will spend a day actively working on your conversational technique during English language or German language sales negotiations or meetings. What are you waiting for? Just Go Flow! Would you like to learn how to be more effective in your international meetings and discussions in one evening? Join our masterclass to find out just how simple it can be. Improve your ability to communicate and participate in discussions just like a native speaker with some simple techniques. By employing basic communication strategies and applying the ground rules for grammar we can help you to become clearer and more concise in reaching mutual decisions during a meeting. As an added bonus, we will cover a couple of well-known business idioms that often help native speakers tackle difficult issues with greater ease. Don’t miss out on this chance to jump start your ability to communicate and become more effective in Business English. NOTE: Limited to a select number of participants and to those with a B1/B2 level of English only. The workshop will consist of two parts: a morning session that will cover basic communication skills, grammar and what do we consider meetings or negotiations language to be, and an afternoon session of roleplaying sessions to activate what was covered. For those looking to build up a more solid foundation and understanding of Business English. Have you been struggling to express yourself in an international meeting or negotiation? Feeling frustrated given that this is one of your strong points in Dutch? Are miscommunication and disagreement something you recognize as an outcome of your meetings and negotiations? Join our Business English Meetings & Negotiations workshop to learn how to tackle many of these common issues that the average Dutch business person runs into daily. Sabine Heijmans (born in Canada) is an experienced English teacher who has the ability to quickly tackle your problems when you are using the English language. She’ll help you improve your knowledge of English in no time. Go Flow Masterclass and Go Flow Workshop can also be held at your company. Just contact us for additional information.